For the first time, a complex formed by polyaniline (in its organic metal form) and silver has been deposited on copper in nanoparticulate form. When depositing on Cu pads of printed circuit boards it efficiently protects against oxidation and preserves its solderability. The deposited layer has a thickness of only nominally 50 nm, containing the Organic Metal (conductive polymer), polyaniline, and silver. With >90% (by volume), polyaniline (PAni) is the major component of the deposited layer, Ag is present equivalent to a 4 nm thickness. The Pani–Ag complex is deposited on Cu in form of about 100 nm small particles. Morphology, electrochemical characteristics, anti-oxidation and solderability results are reported. Polyaniline is known as a conductive polymer and object of intensive studies for many years [1–4]. Especially the possibility of forming nanofibres from PAni has motivated many researchers [5, 6]. The fact that PAni primarily exists in form of about 10 nm small nanoparticles  is less well known and has not inspired too much additional research work outside our labs. The same holds for the possibility to improve the electronic transport properties of PAni by dispersion, which allows (under appropriate conditions) PAni to cross the insulator-to-metal transition and become a true metal (however, a nanometal with both metallic and tunnelling contributions to the electron transport) . The strong effect of PAni in the prevention of Cu oxidation has been published by us many years ago  and is in commercial use since almost 10 years in a process for finishing printed circuit boards and providing solderability after storage and thermal ageing. Here, a PAni1-water dispersion is used as the Cu surface preparation “predip” prior to an electroless Sn deposition . In the meantime this process is well established and widely used in the printed circuit board industry as one of the alternative finishes which are required for the lead-free electronics manufacturing (lead-free soldering during the assembly of PCBs with the necessary electronics components). 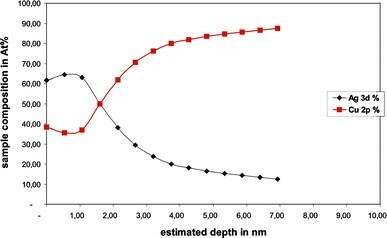 In this process (ORMECON CSN) the PAni predip is applied forming an about 80 nm thin adsorbed layer which results in the formation of selectively Cu(+1) and a passivation of Cu, in addition, it takes part as a catalyst to provide electrons for Sn(2+) which is subsequently deposited onto the Cu. It was the object of our research for 10 years to provide a solderable surface finish for PCBs which would mainly contain the organic nanometal PAni. However, it took until 3 years ago that we became able to combine the two necessary functions into such a Cu surface finish, the oxidation prevention and the solderability preservation without the need of a final micrometer thick metal layer on top of it . However, with this technology, it was not possible to prevent discoloration of the preserved pads, and the thermal ageing performance did not reach the level of the already established metallic finishes. Therefore, this process was not successfully introduced into the market. Surprisingly, it was possible to generate a totally different morphology and performance when adding a minor amount of Ag (in form of AgNO3) to the aqueous dispersion og the Organic Metal. In the following, the characteristics of this new dispersion and the resulting nanolayer will be described. Polyaniline powder has been synthesized by oxidative polymerization of aniline in the presence of p-toluene sulfonic acid as dopant as described in . The resulting green polymer powder has a conductivity of 5 S/cm measured as a pressed pellet (10 t pressure at room temperature for 5 min). The subsequent dispersion of the polyaniline was performed according to the process described in reference . First, a polyaniline dispersion in water was created following reference . The dispersion has a particle size of 55 nm (measured by Laser Doppler technique) and shows a conductivity of 180 S/cm when deposited as a homogeneous layer on a glass substrate. Dispersing and surface-active agents to improve soldering and AgNO3 (150 mg/L) are added to the dispersion. After thorough mixing the dispersion is ready to use. The process of providing a solderable surface finish for PCBs using the organic metal/silver nanoparticle finish (as shown in Fig. 1) is a procedure starting with an acid cleaning, followed by a microetch pretreatment step and then by the deposition of the active organic metal/silver layer, ending with rinsing and drying of the PCB. The OM/Ag dispersion deposition is made at 35 °C for 90 s.
In the first step the PCB is pretreated by a dispersion containing polyaniline (1). In the following step the board is cleaned using an acidic solution (2), followed by two rinsing steps (3 & 4) in water. An acidic solution is used as a conditioner (5). In the most important step the organic metal/silver nanolayer is deposited on the PCB using the aqueous dispersion of polyaniline containing a silver salt (6). After that the PCB is rinsed twice in water (7 & 8) and dried (9). With a galvanostatic coulometric measurement (GCM) a metallic coating is removed from its metallic or non-metallic substrate by using an electrolyte and applying an electric current (according to DIN EN ISO 2177 and ASTM B504). The current is controlled (frequently held constant) and the potential becomes the dependant variable, which is determined as a function of time. The constant currenti applied to the electrode causes the metallic coating MeAto be oxidized at a constant rate to the product MeA n+(n = number of electrons reduced). The potential of the electrode moves to values characteristic of the couple MeA/MeA n+. 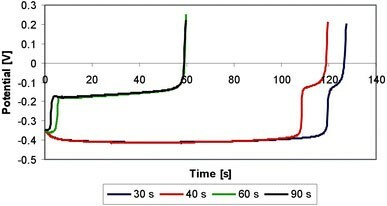 After the complete oxidation of the coating MeAthe potential at the electrode will rapidly change towards more positive values until a second oxidation process can start at the new interface MeB(intermetallic phase or second metal). with i = applied constant current, t = transition time, M = molecular weight, n = number of electrons, F = Faraday constant. Equation 1 does not hold if secondary reactions occur and the current is not exclusively used for oxidation of MeAor the reduction of oxides. The electrochemical cell consists of a working electrode with a 0.25 cm2area, designed specifically for the evaluation of layer thickness, a platinum wire counter electrode and a reference electrode (Ag/AgCl in 3 mol KCl). The test electrolyte is filled into a 50 mL glass body with three 14.5/23 standard tapers and the electrodes are mounted with taper joints. The electrolyte used was a water-based solution of potassium thiocyanate. The electrolyte was not deaerated. The finish of the copper surface in dependenace on the immersion time in organic metal/silver nanoparticle finish is displayed in Fig. 3. The potentials indicate that the amount of free copper surface decreases slowly at the beginning of the process, having the highest rate between 40 and 60 s immersion time and after 60 s the rest of the free copper surface is coated slowly. After about 90 s there is no free copper detectable. 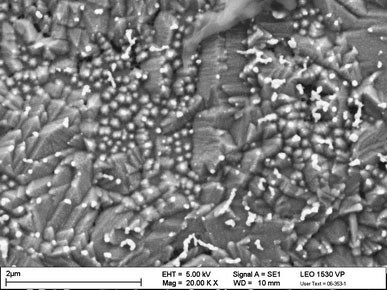 Figure 4 shows a scanning electron microscopy (SEM) image of copper pad of a PCB after treatment with the organic metal/silver nanoparticle finish. The SEM investigations were performed by the institute nanoAnalytics GmbH in Muenster, Germany. The measurements were done using a field emission SEM from LEO, type 1530 VP with appropriate test panels on which the Pani–Ag complex had been deposited under standard conditions. The microscope is calibrated regularly using a standard certified by the PTB (Physikalisch Technische Bundesanstalt in Braunschweig, Germany: standard #5282-PTB-04). The X-ray photoelectron spectroscopy (XPS) investigations were performed by the institute nanoAnalytics GmbH in Muenster, Germany. The measurements were done using an ESCALAB 250 from Thermo VG Scientific with appropriate test panels on which the Pani–Ag complex had been deposited under standard conditions. The information depth is about 5–10 nm, the detection limit differs from element to element but is around 0.1 At%. Monochromatic Al Kα X-rays were used (15 kV, 150 W) and the spectra were measured using a pass energy of 80 eV for survey spectra and 30 eV for core level spectra. If necessary charge compensation was done using a Flood Gun (e- energy ∼6 eV/0.05 mA current). 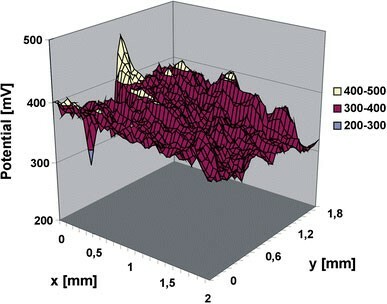 Quantitative information about the surface composition was calculated from survey spectra using the standard Scofield sensitivity factors . The error can be estimated to be typically ∼10%; statistic errors of single measurements were calculated using the method of Harrison and Hazell (SIA, 18, 1992, p. 368–376). 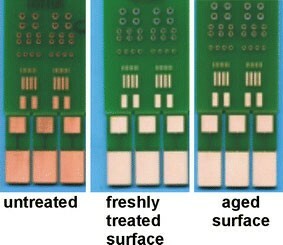 Figures 5 and 6 show depth profiles of copper and silver on the treated copper surfaces before and after reflow. At the surface the silver to copper ratio changes during the reflow process (the ratio became smaller), but from a depth of about 2 nm on no change in the ratio could be detected after the reflow process. 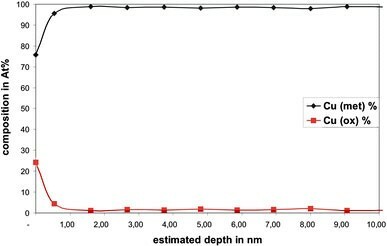 The ratio of metallic to oxidized copper on the surface of the fresh sample and the sample after reflow are shown in Figs. 7 and 8. This ratio did not change in the reflow process. 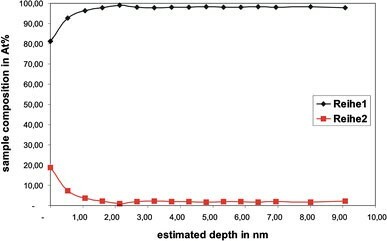 The surface potentials of copper, oxidized copper, silver on copper after immersion and organic metal/silver nanoparticle finish on copper after immersion were determined using a scanning kelvin probe (SKP, UBM Messtechnik GmbH). The volta-potential measured with a kelvin sensor is suitable for non-contact measurements of surface potentials [15, 16]. The measured object, the working electrode, and the reference electrode of the Kelvin probe form, due to the small gap between them, a capacitor. The amplitude of the potential developed between them shows the degree of surface activity. A periodic variation in separation by means of an actuator built into the sensor changes the capacitance of the set-up. The resulting signal is converted to a measurement signal by means of a lock-in amplifier . The volta-potential difference is directly determined by the surface potential . As vibrating reference electrode a tungsten wire with a tip diameter of 80 μm was used. The tip was positioned about 25 μm above the specimen, the vibration amplitude was ±10 μm and the vibration frequency of the needle was 1.75 kHz. As the measurements were performed in laboratory atmosphere, gold was used as reliable reference material. Figure 9 shows a copper surface treated with organic metal/silver nanoparticle finish in the fresh stage after finishing. The Kelvin potentials of different treated and untreated copper surfaces are summarized in Table 1. The thermal aging and solderability determination were carried out by Ormecon in Ammersbek, Germany. The thermal aging was performed to simulate soldering and storage conditions. To simulate soldering conditions test panels on which the Pani–Ag complex had been deposited under standard conditions were aged up to 4 times in the reflow oven RO 300 FC N2 from Essemtec, Swizerland. A lead free soldering profile was chosen with a peak temperature ∼250 °C. To simulate storage conditions other test panels were aged 4 h at 155 °C in the IR hot air oven Techno HA-06 from Athelec. The solderability measurements were preformed using the wetting balance Meniscograph ST60 from Metronelec with appropriate test panels on which the Pani–Ag complex had been deposited under standard conditions. The solderability of the panels was determined as wetting angle under lead free soldering conditions. The solder Sn95.5Ag3.8Cu0.7(260 °C) from Ecoloy and fluxer 959 T from Kester were used. The measurement data is converted to wetting angle using the software from Metronelec according to the standard NF-A-89 400P. The performance of copper surfaces treated with organic metal/silver nanoparticle finish and established metallic surface finishes is compared before and after reflow in Table 2. 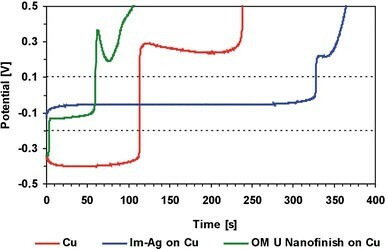 Surprisingly and in contrast to the formerly developed dispersion “OMN 7100” (which forms a coherent thin layer on the Cu surface), the same dispersion only containing a minor amount of Ag is forming a nanoparticulate discontinuous layer. The particles are around 100 nm small and exclusively located on the phase boundaries of the Cu crystallites. 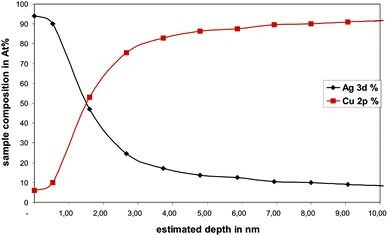 Assuming a density of 1.3 g/cm³ (as in Polyaniline) and a transfer of 2 electrons per 4 aniline monomer units, the electrochemical measurements lead to a nominal average thickness of the Polyaniline-Ag layer of around 50 nm. XPS measurements show that the Silver within these 50 nm only has a nominal average thickness of about 4 nm. EDX studies have not shown that Ag is present in form of any detectable aggregates. It seems in contrast that it is evenly distributed within or around the Organic Metal particles. The electrochemical investigation (Fig. 2) shows that not only the morphology is totally different from the layer which is formed using the same polyaniline dispersion without Ag ions, but also a new form of complex has formed. The potential at which this complex is oxidized is significantly different from Ag on Cu and also from polyaniline alone. This is also confirmed by the Kelvin probe measurements which show the surface potential (Fig 9 and Table 1). The XPS shows a very small amount of the Cu surface atoms to be in oxidized stage even after thermal ageing under ambient atmosphere (Figs 7 and 8), only around 20–25%, and ageing does not change the degree of oxidation. Also, during ageing, the Ag does not migrate into the Cu (Figs 5 and 6). For the practical industrial application in PCB assembly, this surface finish seems to be exceptional. It does not show any discoloration during reflow, and the wetting behaviour (according to wetting balance studies) is superior to any metallic surface finish (Table 2). First practical tests in PCN manufacturing and in assembly facilities have confirmed this. Figure 10 shows a printed circuit board before treatment, directly after the surface finish with organic metal/silver nanoparticle finish and the surface after treatment and aging. A nanoparticulate complex between the organic metal polyaniline and Ag has been described for the first time. A new type of nano size surface finish for metals (here: Cu) can be deposited using a dispersion of this complex. Although it does not form a continuous nanolayer, it completely and effectively shields the Cu and prevents it from being oxidized. Its ageing resistance and wetting (soldering) performance is excellent and superior to established metallic finishes. 1The polyaniline used in this process is doped withp-toluene sulfonic acid.